Okay, looks like it's official. It's Pence, which means I have been passed over again. I am once more experiencing that sense of disappointment I feel each year when People names it Sexiest Man of the Year. Not funny, TM. I've got feelings, ya know. My personal situation aside, here's a dissenting voice on Pence and a warning. 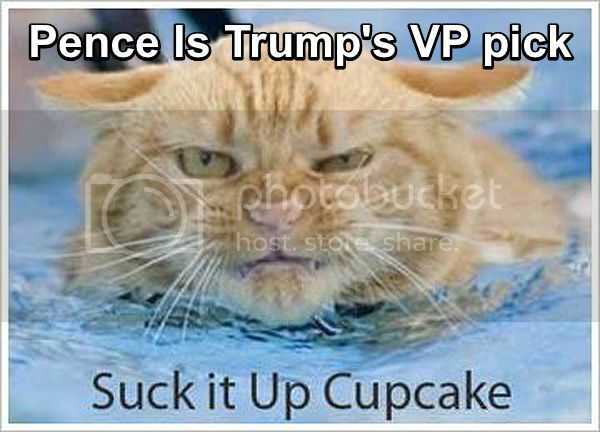 I agree with Patrick Cleburne, Pence is a bad choice. Pence differs with Trump on immigration, trade, and foreign policy–the very core of Trump’s nationalist/America First message that has propelled him to this point. Moreover, Pence showed during the debate over religious liberty provisions in Indiana that he is not ready for prime time. I hope that I am wrong, but I don’t see him holding up under the scrutiny he will receive in a fiery baptism courtesy of a hostile press corps. Finally, Pence is a standard Koch brothers/Wall Street Journal/Forbes Magazine conservative. He represents what is wrong with the GOP and why it needed to be routed. Trump would have been much better picking a loyal supporter who challenges the smelly orthodoxies of a dying “conservative” movement (e.g. Jeff Sessions). If obammy hasn’t been impeached by now, trump will never be impeached. This is TOTALLY WRONG. In impeachment is analogous to a vote of No Confidence in the British House of Commons, not a criminal trial. A man could be impeached for the color of his tie. It is normal to wrap an impeachment up in legal grievances because usually that is needed to muster the votes. I expect Paul Ryan, Lindsey Graham and the other RATS are already formulating the Bill of Impeachment. And if you think the Democrats will not support it, you have not been watching the pure hatred spewed into the MSM about Trump in the past year. Nominating someone far preferable to the Washington gang for Vice President is absolutely begging them to try it. That is why it was imperative to choose someone even less acceptable, like Ted Cruz, Mo Brooks or Kris Kobach. Did Trump pay for this advice? I tend to agree with Ann on this one, but she's been wrong before! But time will tell! I'm taking some consolation by thinking about Joe Biden's affect on National matters for the last eight years. In that light, I'd say the VP isn't all that important. It's not like Joe Biden matters. Unless Obama is no more. There are other roles for the more like-minded like Sessions, Gingrich and Flynn. And then there's the gentle and insightful Dr. Ben Carson. Trump should find a place for him as well. It is what it is - now onto defeating the evil witch. Kinda hard to dispute the wisdom of Conservgramma, I reckon. Far be it from me to even try! Thanks for posting different perspectives on Pence. I REALLY like John Bolton for some post -- Secretary of State?